The 2010 acquisition of Occam Networks by Calix created a new network access giant in the broadband service space. Worldwide Supply sees the combination as a key support for products like the 700-GE optical network terminals. The 700GE includes both indoor and outdoor units that support 2.5 Gbps GPON and 1.0 Gbps Active Ethernet with a system that automatically detects network elements and what deployment could be best based on existing nodes. Business and residential customers can benefit from a Calix-Occam 700GE unit because of its support for four GE interfaces that support top applications for IPTV video and data as well as two POTS lines that rely on an integrated VoIP line. Why Select a Refurbished Calix-Occam 700GE From Worldwide Supply? 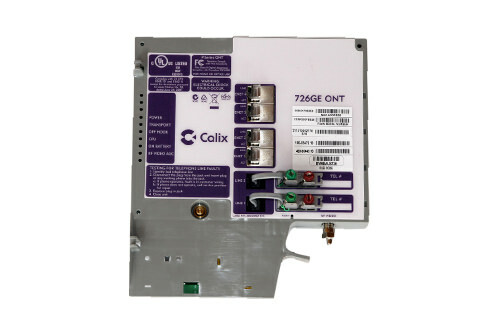 Worldwide Supply provides a complete line of refurbished and used Calix-Occam 700GE terminals that are top-of-the-line choices for terminating GPON or AE fiber links as your subscribers’ locations. Get industry-leading interfaces and support at an affordable rate. We can help you pick the right unit, find the right repair and maintenance plan, keep you in good shape with full parts and give you consistent 24/7 support and fast delivery times to keep your network going strong. Our mission is to support your growth in an affordable way, so we back our refurbished Calix-Occam 700GE models with a leading warranty, full OEM-grade testing and speedy replacements or repairs when you need it most. Discover the right fit for you and choose Worldwide Supply to make sure every network expansion is affordable and reliable.